What do empathy and design have in common? I'll answer with another question: How many times have you picked something up - a book, an electronic device, the directions for assembling a piece of IKEA furniture - and found it poorly organized, confusing to use or utterly unintelligible? This certainly happens on a semi-frequent basis in my home. And I wonder if you too curse the designer or mumble a few choice words that would make your mother blush? Situations like this are the result of unempathic design (though I will admit that, at times, they are also the product of my own stupidity). What do I mean? The designer failed to understand how you would feel with their creation in your hands; they didn't anticipate your needs or questions. To be clear, every thing has some design element to it. The text you read, the car you drive, and the box of crackers you purchased at the supermarket were all designed by someone. The building in which you live and the city in which it is situated all had a designer too, for better or worse. That's the thing about design - it can be done well or done poorly but, either way, it's still design. And in my opinion, poor design is that which is unempathic. Here's another way to put it: Poor design fails to recognize the relationship between utility and significance. In his bestselling book, A Whole New Mind, author Daniel Pink (2006) notes that design is essentially "utility enhanced by significance" (p.70). An item is most valuable and effective when it transcends functionality and begins to create an emotional connection with its user. That is empathic product composition - a design philosophy that understands the user well enough to anticipate needs and meet them in a way that appeals to their senses on a level beyond mere utility. Empathic design, therefore, is generative; it creates a connection. So what does this have to do with syllabi? In re-reading Daniel Pink's book, I was inspired to change my approach for at least one of the courses I'm teaching this fall. As a test case, I chose SSED 331 Teaching Elementary and Middle School Social Studies. Most of my previous syllabus design had been focused on utility. I have tried only to communicate the necessary details (e.g. objectives and graded elements) without any attention paid to how the syllabus would be read, used or perceived by users. I also failed to realize the power of helping students connect with the ethos of a course from the very first day (something that I now believe a design-forward syllabi can do). My design approach had been quite unempathic. And so I tried a full redesign of the SSED 331 syllabus. 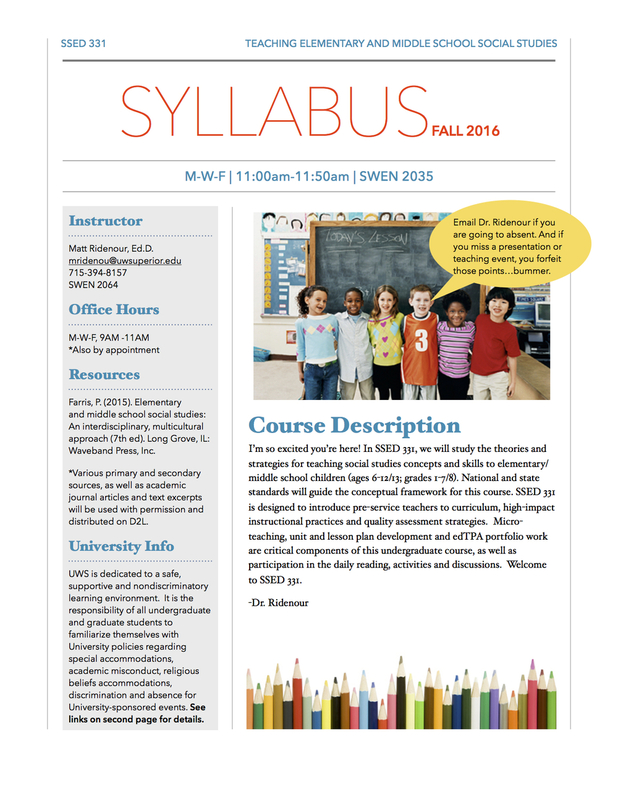 Below is an image of the first page of the syllabus as it previously existed, accompanied by a new design (click to enlarge). So what is it that I really hope to accomplish? Is this simply a gimmick designed (pardon the pun) to momentarily set myself apart? Perhaps. Pink (2006) certainly acknowledges the idea that design is a form of differentiation. But that isn't the objective. The goal is an empathic, user-friendly design that also connects utility with significance. All the information from the original syllabus has been retained, and so the utility is certainly present. But there's something more. Have you ever been drawn to book or music album because of the cover art? Does wine with a cool label taste just a bit better to you? Have you ever chosen a certain seat in a coffee shop because of the view from a particular table? Have you ever walked into an art museum, connected with a piece and been inspired by it? My hope is that an aesthetically-pleasing syllabus connects students to the opportunities the course provides and not just the grade they can earn. My hope is that an intentionally-designed syllabus draws my students closer to understanding not just the utility of the class, but the significance of it as well. My hope is that an empathically-designed syllabus anticipates the needs of students so that they can move beyond the logistics of the course to focus on the content. My hope is that, from the very first day, students can get a sense of the spirit and atmosphere of the class just by looking at the syllabus. Is it possible that a syllabus can do all of this? Perhaps it is a lofty and idealistic desire. But hey, I'm a teacher...and I know from experience that pursuing the unlikely isn't always a waste of time when students are involved.